Custom Audio is the premier source for all of your mobile audio needs. We sell and install Alarms, Remote Start Systems, Head Units (in dash cd/dvd), Speakers, Amplifiers, Subwoofers and Custom Fabricated Enclosures, Audio Wiring, Power Distribution Products and a lot more! 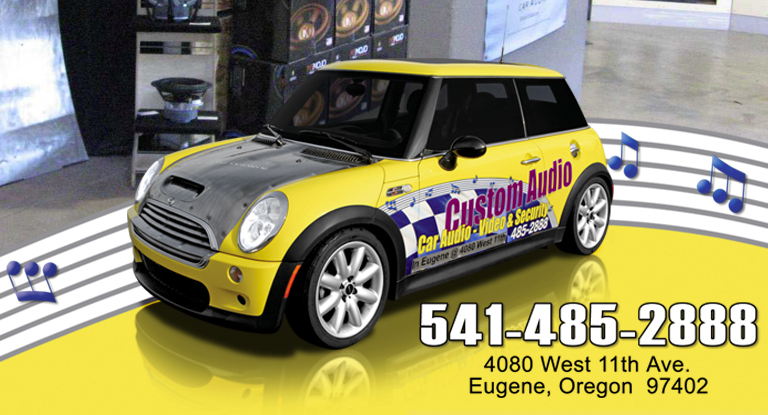 Located downtown West Eugene, Custom Audio specializes in custom fabrication. Dean Higgins opened the store in 2001. With over 25 years of experience in the industry, it’s his goal to sell and install quality products. We are dedicated to seeing our customers through the whole process. From picking the products that best fits their needs, to installing with precision and care. Here at Custom Audio, we install car audio systems, marine audio systems, alarm systems and much more. We carry a multitude of vendors such as Clarion, Pioneer, Kenwood, Infinity, Memphis, Sirius, XM, Morel, Kicker and many others. Here at Custom Audio we have a highly trained staff that will take the time to educate every customer, new and returning, on the products they’re looking for. For the majority of people, the first thing they want to do when they get in their vehicle is turn on the radio, pop in a cd, or hook up their iPod/iPhone. We tend to match our moods with the music we play and hearing our favorite song at the right moment can make our whole day! A lot of cars come from the factory with medium class audio systems. As much as you care about your music in your vehicle, why not upgrade the sound? Custom Audio will help you find the system that’s right for you. We install a lot of audio systems with a Bluetooth interface. Link your phone with your car for a hands free, safe drive. This modern connectivity is in extremely popular demand! The staff here is passionate about their work. They’re creative with their custom orders. And they strive to provide the best possible customer service. Stop by the shop and check out our products! We’ll be happy to help! Check back in next week for a blog on Car Alarm Systems!